Street Address : 120 Sir John A. MacDonald Blvd. This water tower was originally part of the penitentiary farm. Construction was carried out by inmates and was completed in 1895. The stones were quarried and cut by inmates. They were then shipped to the site by rail on a small-gauge track that linked the Penitentiary to the farm and quarries. At five stories high (87 feet tall), situated on a hill, this is a well-known landmark and features unusually ornate stonework. Water was pumped from Lake Ontario to the Water Tower. This water was stored in a 75,000 gallon metal tank located in the upper two floors of the tower. The height of the water provided pressure so that the water could be piped around the surrounding area. 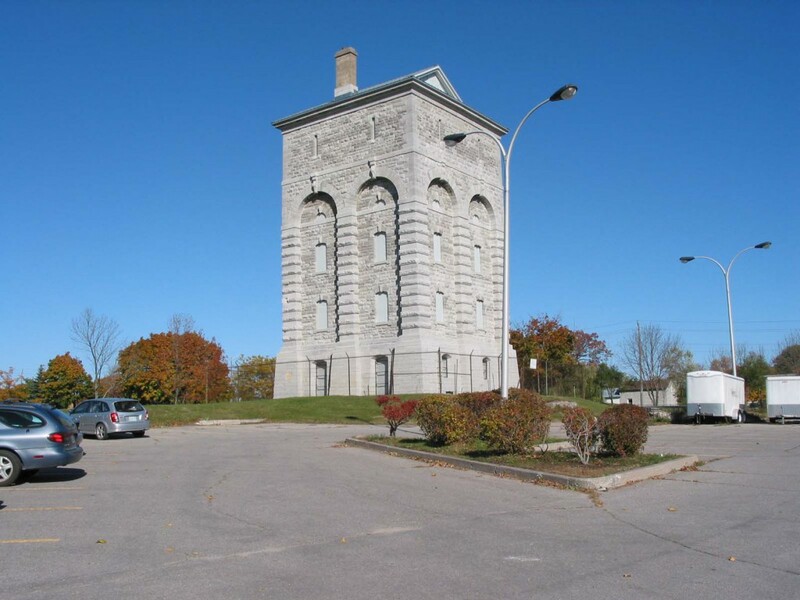 At one time the Water Tower provided for the Kingston Penitentiary, the Prison for Women, Collins Bay Penitentiary. Beneath this massive iron tank, which was built by the Montreal Iron Works, are two 3-storey apartments in a duplex arrangement on the north and south sides. On the first floor of the apartments there was a kitchen and living room. The second floor held two bedrooms, while the third floor had one bedroom and a bathroom. The fourth & fifth floors were completely occupied by the large water tank. It rests upon steel I-beams which cross the tower horizontally. Penitentiary staff paid reasonable rent for these unique dwellings. Jan Buist, an officer at the Kingston Penitentiary, his wife and five children occupied the north apartment during the 1960s. At that time, Officer Jim Morrison, his wife and their six children lived in the south apartment. Mr. Buist recalls that living in the water tower was not without its problems. When the float in the tank was not functioning properly it would sound like “Niagara Falls” inside the apartment, as the overflow pipe took in the excess water from the teeming tank. It was not unusual for tenants at the apartments to have to call down to the Kingston Penitentiary and ask that the pumps drawing the water from Lake Ontario be shut off because the large tank was overfilling. The Buist’s and the Morrison’s were the last families to occupy the Water Tower apartments, leaving in 1964. At that time the Department of Justice decided that it would cost too much to renovate the apartments, which needed electricity upgrades. 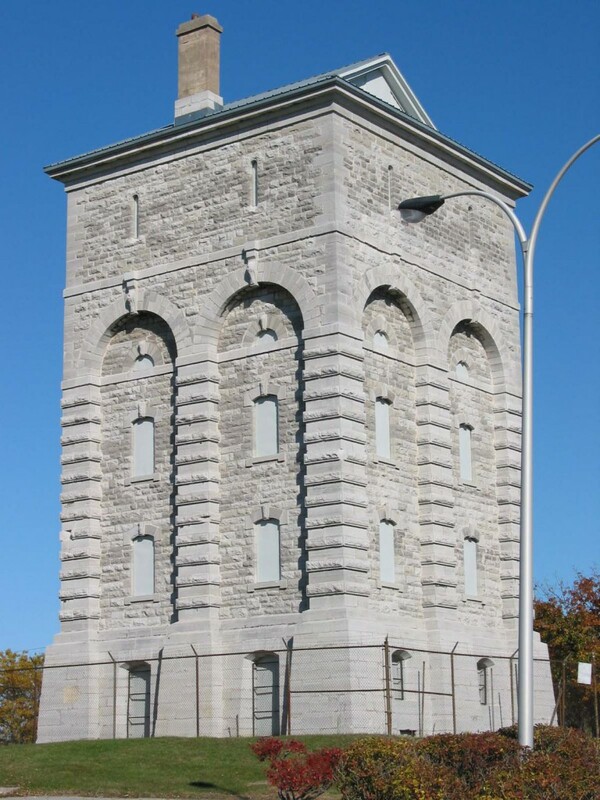 Queen’s University purchased the Water Tower and the surrounding lands from the penitentiary in 1965.